Benefits computer science can bring the cerebral palsy community remained our focal point Wednesday, March 1st, 2017. 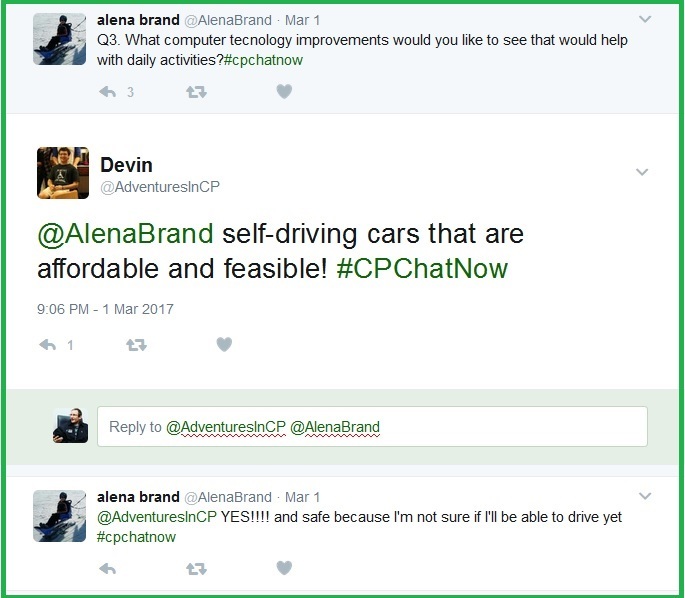 Long-time #CPChatNow participant Alena Brand led us in the chat. I am co-host Zachary Fenell, finally here to recap the evening. First, I apologize for the delay. Between a power outage and spotty Internet connection getting this recap done proved a challenge. In fact the power outage caused me to miss #CPChatNow Wednesday, March 8th for the first time since September 2014. Therefore I am looking forward to my co-host Devin Axtman‘s upcoming recap. Anyways, enough self-revolving talk from me! 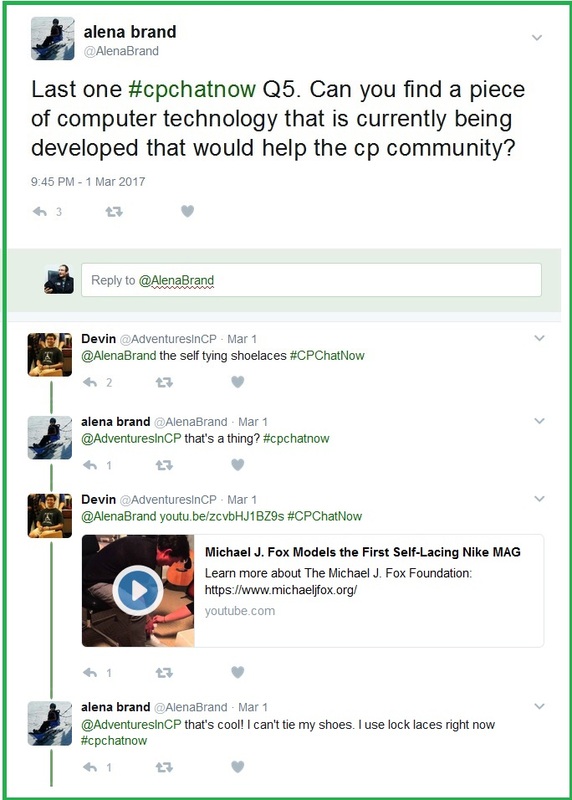 Time to highlight our March 1st, 2017 chat. Oh, the many highlights too! Alena sparked great dialogue with her questions. 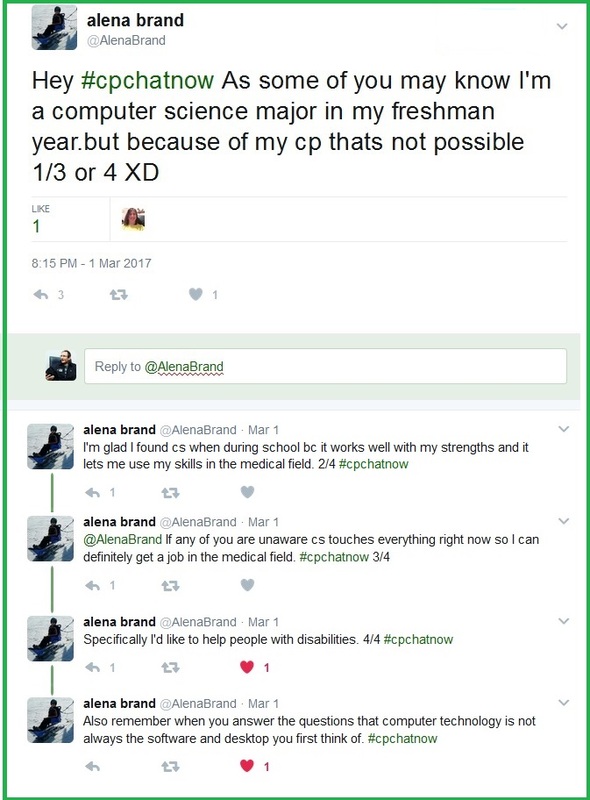 Before diving into those however, Alena shared her credentials to lead our computer science focus chat. 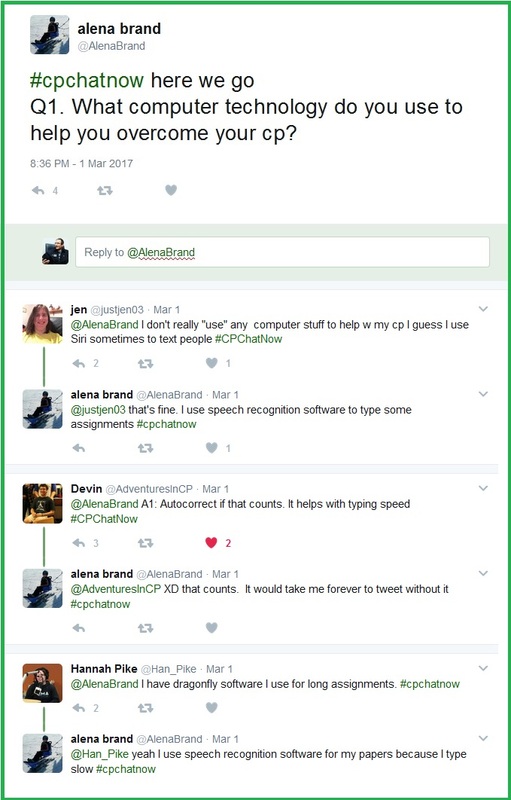 To begin Alena asked us to name computer technology we use to help overcome cerebral palsy. Speech recognition software ended up a re-occurring answer. Specifically Dragon and Siri received mentions. Devin’s answer stood out against the other responses captured in the above screen shot. Although you may not necessarily think about auto correct as a disability related tool, my co-host made a valid point. Auto correct does enable you to type faster by lessening concerns over errors. 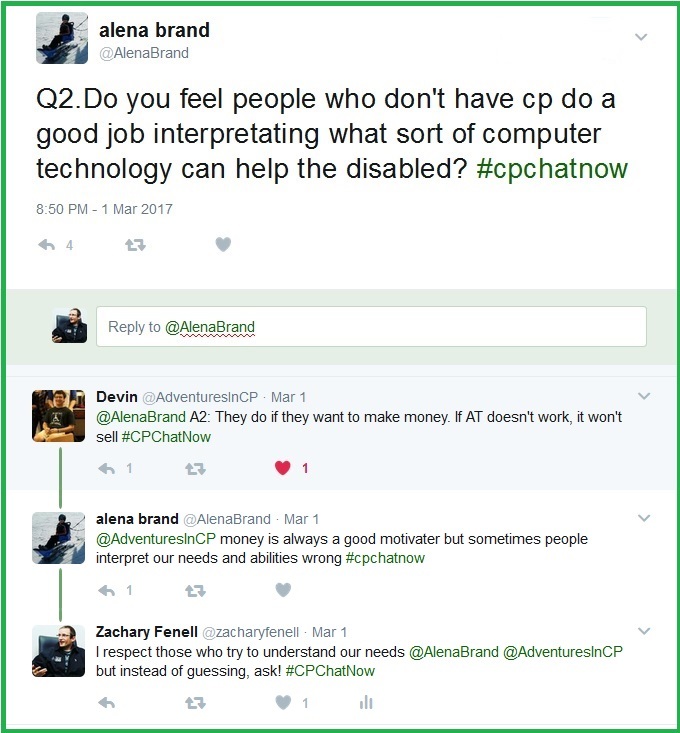 Next Alena inquired about if the non-disabled interpret the CP community’s computer technology based needs well. Moving onto question three, Alena asked what improvements we want to see in computer technology which would benefit our daily activities. As other replies rolled in a desire for self-driving cars emerged a popular one. 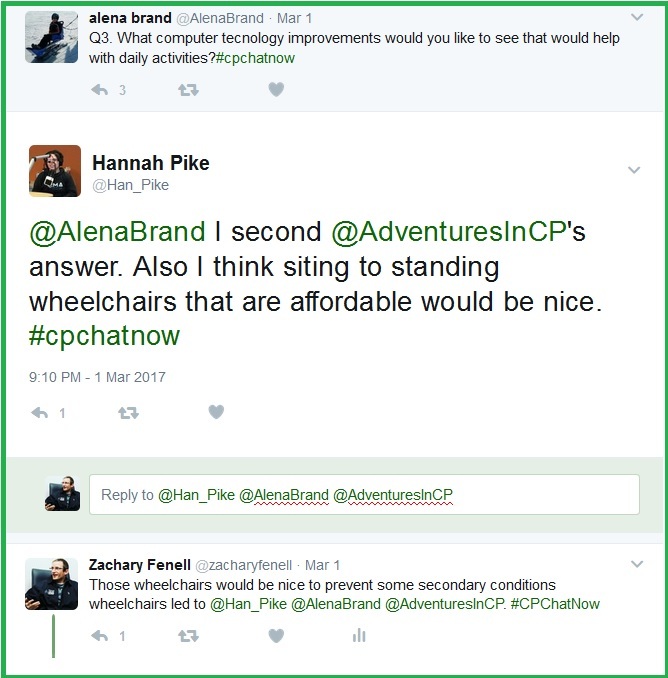 Besides self-driving cars, Hannah also hopes to see affordable standing wheelchairs become more commonplace. What about you? Do you possess interest in self-driving cars? Do you want to see improvements with standing wheelchairs? Maybe another computer technology intrigues you. 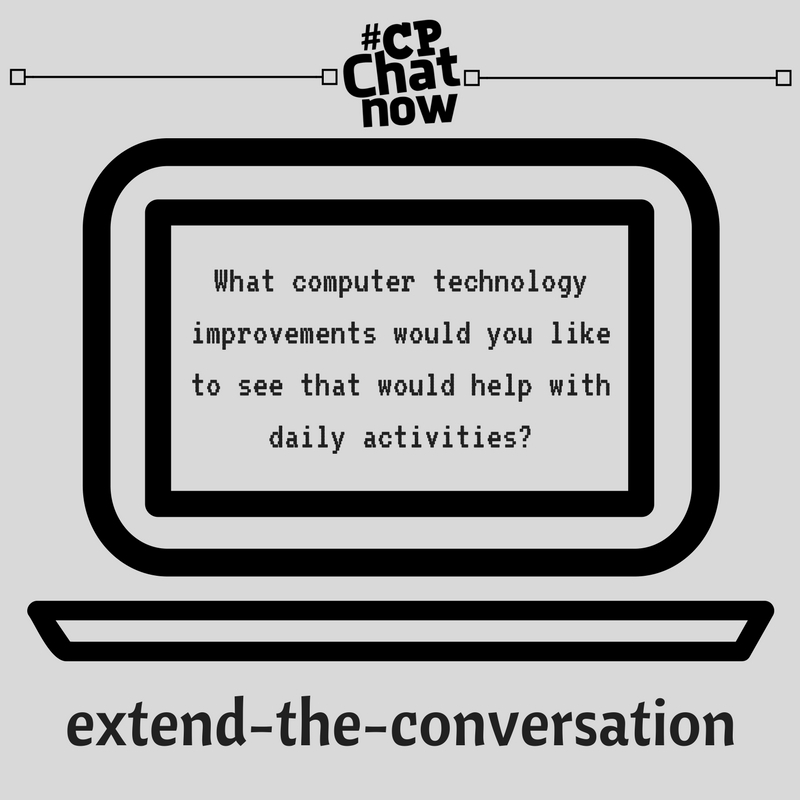 Add your input by answering as the extend-the-conversation question, “What computer technology improvements would you like to see that would help with daily activities?” Reply in the “Comments” section. 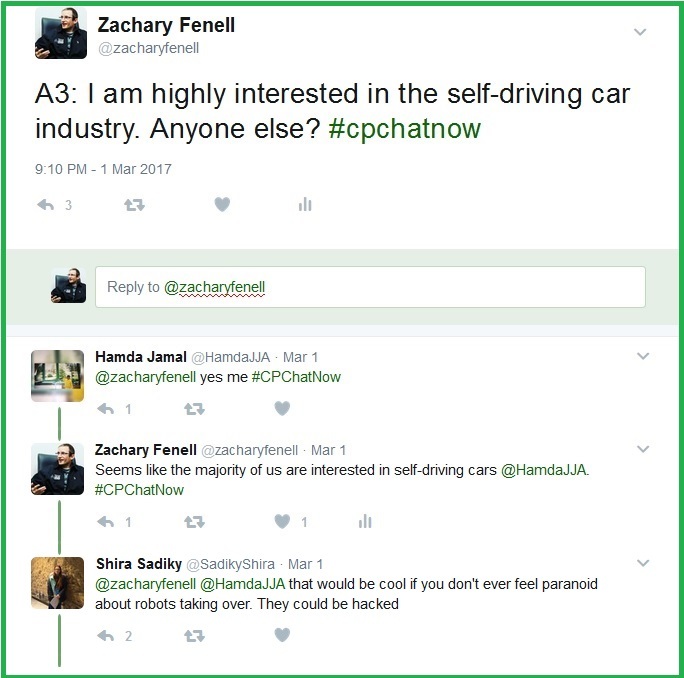 Going back to self-driving cars for now though, Shira raised a great point about hacking. 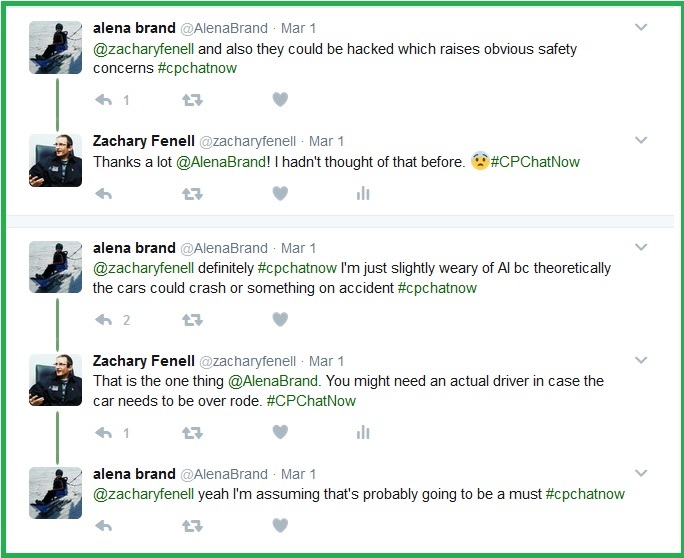 An issue Alena echoed while bringing up other safety concerns with self-driving cars. Continuing with an eye to the future we closed the night discussing computer technology currently in development, but which could benefit the CP community greatly in the future. If those shoes pique your curiosity, below you can watch the video Devin linked to. Respond to the extend-the-conversation question in the “Comments” section. Wrapping up remember to answer the extend-the-conversation question. Answer by leaving a comment! Until next time.